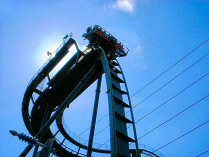 Hot on the heels of Rita - Queen of Speed, Oblivion also needs a major part replacing. The ride's lift hill chain apparently needs replacing, as it has come to the end of its working life. It is the original chain that has been in place since the ride opened in 1998, and it is said to be having 'issues'. Like Rita's drum replacement, this change is not a simple task, and it is predicted that the work will take the majority or even all of the closed season to complete. The park have not ruled out the possibility of giving the ride a spruce-up, as they did with Nemesis over the last closed season, but it is down to whether there's any spare money in the budget. It has been stressed that the chain is not being replaced for the Ropers' sake.